Everyone seems to can’t get enough of juicy watermelon in the summertime. Nothing is as refreshing as the sweet, juicy taste of a watermelon on a summer day. But, a watermelon can only be as good as the 1 you pick from the market. You have always thought that choosing a great watermelon is up to chance. Well, there are actually several ways to spot the perfect watermelon. 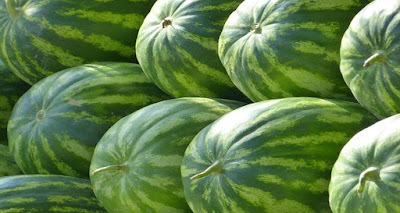 When looking at watermelons, the first thing that sticks out are those weird white spots. However, these spots, referred as the field spots are quite natural. The field spot is the area where the watermelon rested on the ground. While every watermelon contains a field spot, the best watermelons have that orange-yellow and creamy-yellow spots. You may have not known this, but watermelons have genders. The boy watermelons are tall and elongated, while the girl watermelons are round and stout. The boy watermelons are more watery than the girl melons, while the girl watermelons are sweeter than the boy watermelons. We always think that bigger is better. So we usually want the biggest watermelon, but in reality, average-sized watermelons are the best. Don’t go for too small or too big, just right. The tail of a watermelon indicates its ripeness. A green tail points out that it was picked too soon and will not taste as good. Go for the ones that have dried tails for the best taste. Thump the watermelon. The watermelon is ripe if it sounds hollow. Watermelons don’t sweeten after they are picked, so the time that they are harvested is important. They generally ripen over 2 weeks so keep your eye on them. The number of webbing on the shell of a watermelon shows the number of times the bees touched the flower. The more it is pollinated, the sweeter the watermelon. Watermelons can be stored uncut for up to 10 days. Wrap it tightly in plastic. They can be stored in the refrigerator for about 4 days, if cut. Watermelon does not only boost your immunity but it is has excellent vitamin levels of vitamins A and C and a good level of vitamin B6. Vitamin A found in watermelon is necessary for optimal eye condition and enhance immunity by improving the lymphocytes—the one that fights infection of white blood cells. Antibodies are necessary to fight many sicknesses. Vitamin B6 aids to normalize nerve function and form red blood cells. Your body uses it in breaking down proteins. The more you eat protein, the more vitamin B6 you need. Vitamin C found in watermelon can boost the immune system’s defenses against infections and viruses and can defend a body from harmful free radicals that can accelerate aging and conditions like cataracts. A 2-cup serving of watermelon is rich in potassium, a mineral needed for water balance and found inside of every cell. Individuals with low potassium levels can experience muscle cramps, so they must regularly eat watermelons. The next time you buy a watermelon, pick the average sized, stout and round-shaped with creamy-yellow field spots and has plenty of webbing on it. Also, make sure to go for the watermelon that has dried tails.